The slight, almost imperceptible tug on the rod tip signaled that the sheepshead had taken the crab in his mouth. Pulling back gently to tighten the connection, I waited for the second tap. At this point, history has taught me that it may be too late, the crab crushed and the fish gone. But there it was, another light tap. The classic tug-of-war battle was on. The sheepshead did his best to return to the structure below, bending the rod double on surging runs and taking drag. Photo provided by Captain Miles Altman. After several minutes we finally had color; the black-and-white striped, master bait thief was close. But they never give up easy. The fish took line again and headed for the depths, going back and forth until finally it was close enough to slide the net under. This beauty weighed around eight pounds and was mostly grown; weights in the double digits are possible, but few are caught over the ten-pound mark. 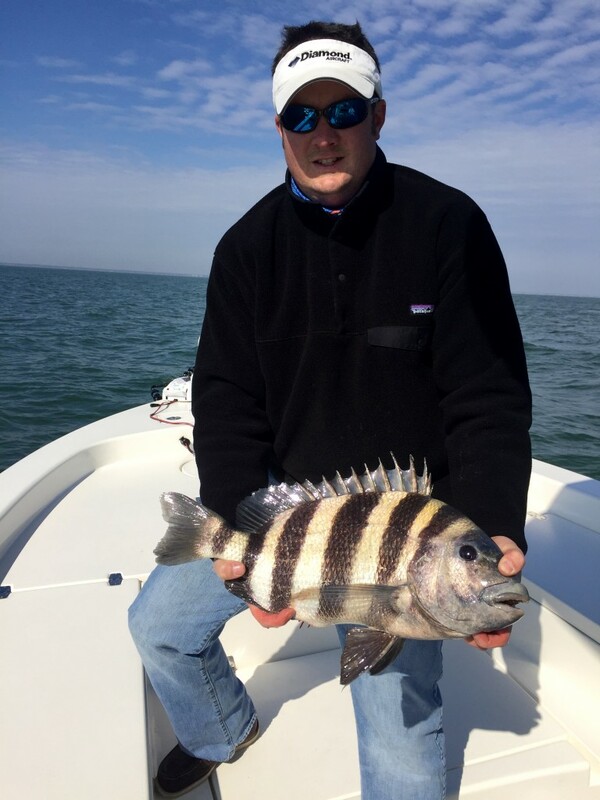 Sheepshead are present year-round in the Lowcountry, but March is a banner month for this fishery. A member of the snapper family, they rank in my list of favorites to catch. They’re difficult to hook due to their feeding habits and a real scrapper when it comes to fighting, but they are delicious on the plate. They use large sets of almost humanlike teeth to crush barnacles, crabs and other hard shell critters, and the preferred bate for most anglers are fiddler crabs. The most common rig for catching these fish is a fish-finder rig, a sliding sinker rigged above a short leader with the hook at the end. Dropping the crab over structure until the sinker hits bottom, then reeling the sinker a foot up allows the angler, if he’s lucky, to feel the light tap or tug when the sheepie takes the crab in his mouth. Only seconds pass before the sheepshead crushes the crab, spits the hook and then is on his way. Needless to say, you need a good supply of fiddlers if you want to seriously fish for sheepsheads. Fresh clams and live shrimp are also productive baits. One of the things I like most about March is that sheepshead are the harbingers of the season. They kickstart our local spring, keeping us busy until the cobia show in late April and May. But that’s another month and another story. Now, it’s time to catch the sheepies!